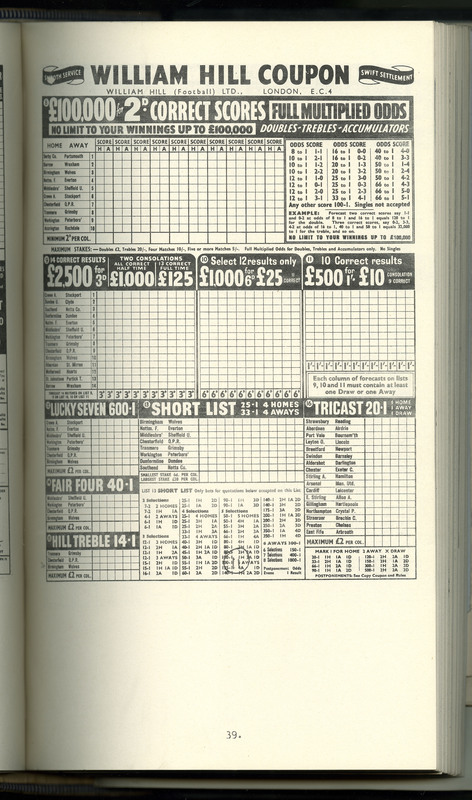 One of the most fascinating episodes in British copyright history was the one that confronted, in the early sixties, two of the largest betting companies and bookmakers: Ladbroke and William Hill. 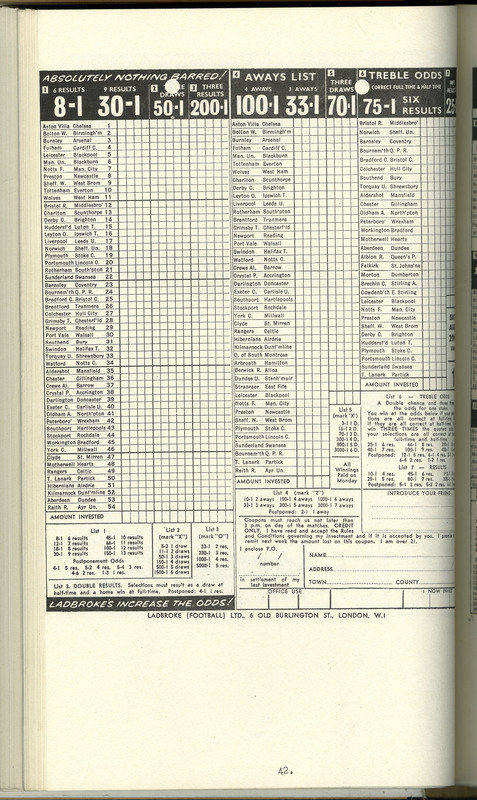 The case arose out of a dispute over the subsistence and the infringement of copyright in William Hill’s “fixed odd” football coupons, a sheet of paper on which lists of forthcoming matches were printed. 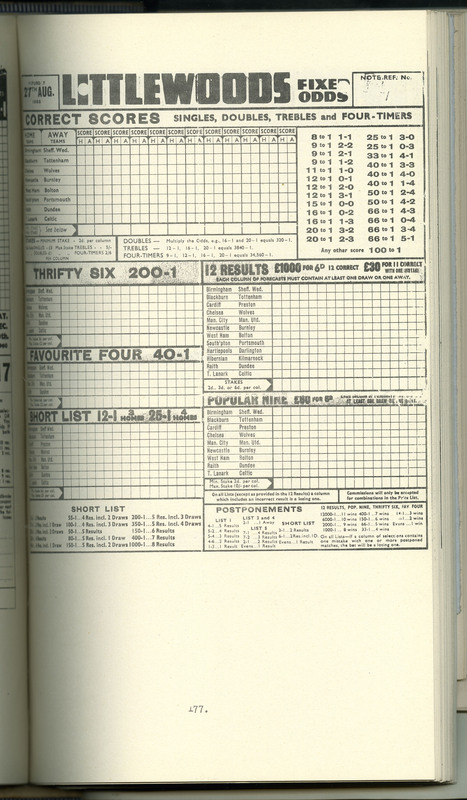 William Hill had been using these coupons since the early 1950s and, when Ladbroke had decided to enter the field, it adopted a similar product. 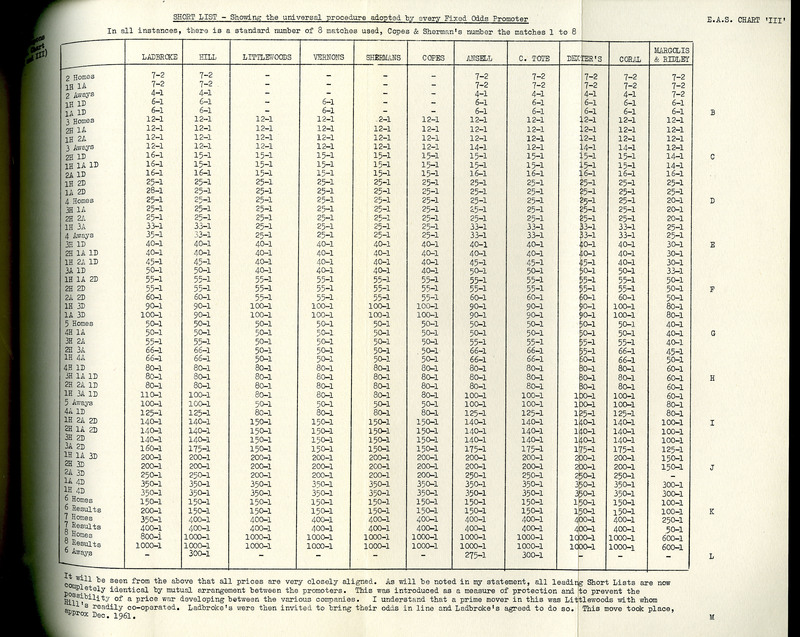 The coupons are depicted in the attached images along with a table comparing the content of the pools coupons of the parties with those of their competitors (to highlight what was original or perculiar to the claimants). The claim primarily related to the coupons as compilations (no claim was made as regards the football fixture details themselves). Even at the start of the litigation, the parties had chosen formidable counsel. William Hill was represented by Frank Soskice QC (1902-1979), who in 1964 became Home Secretary. Ladbroke’s leading counsel was Gerald Gardiner QC (1900-1990) who had represented the defendant publisher in the trial relating to Lady Chatterley’s Love and in 1964 would be made Lord Chancellor. 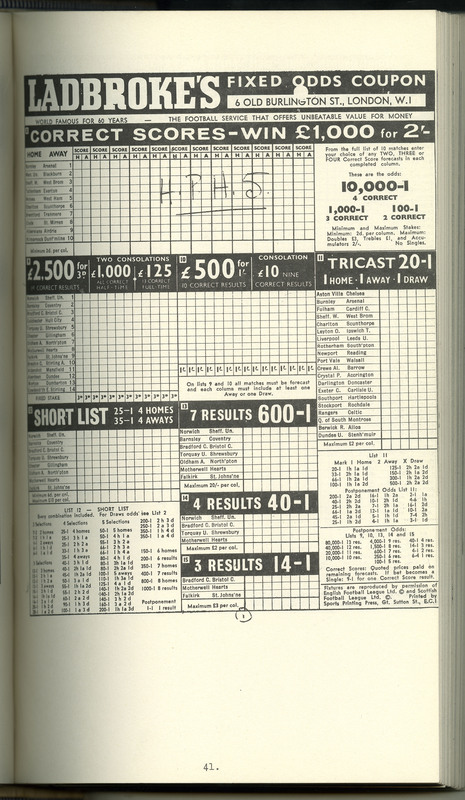 At first instance (The Times, 27 June 1962, p 8D), Lloyd-Jacob J found that Ladbroke had copied William Hill’s material but held that no copyright subsisted in the coupons themselves. The judge awarded a limited injunction in relation to copyright infringement in the rules. 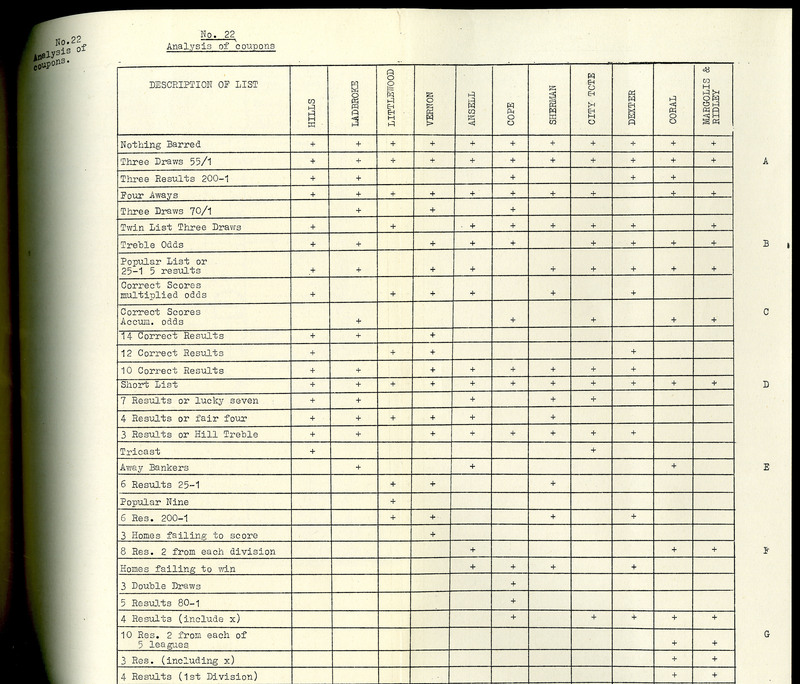 However, Lord Denning MR did consider the selection of 16 lists of different bets, and their incorporation in a coupon with headings and notes was a “compilation”, and Ladbrokes had infringed by copying fifteen of the lists and much of the headings and notes. In January 1964, following seven days of argument the previous November, all five of their Lordships (Lord Reid, Lord Evershed, Lord Hodson, Lord Devlin and Lord Pearce) dismissed the appeal and upheld the finding that the coupons were copyright-protected “original” compilations and that Ladbroke had infringed. In delivering their judgment, the Lords emphasised the amount of work, money and ingenuity devoted by the plaintiffs and the substantial copying that the defendants carried out. The decision cemented the centrality of the requirement of “labour, skill and/or judgment” to any finding of originality under British law. They also highlighted the type of comparison necessary to appreciate a copyright infringement. Instead of dissecting the work, an overall comparison of the two works was required. A few months after the decision, a soccer Bill was drafted containing an explicit reference to the question of copyright. 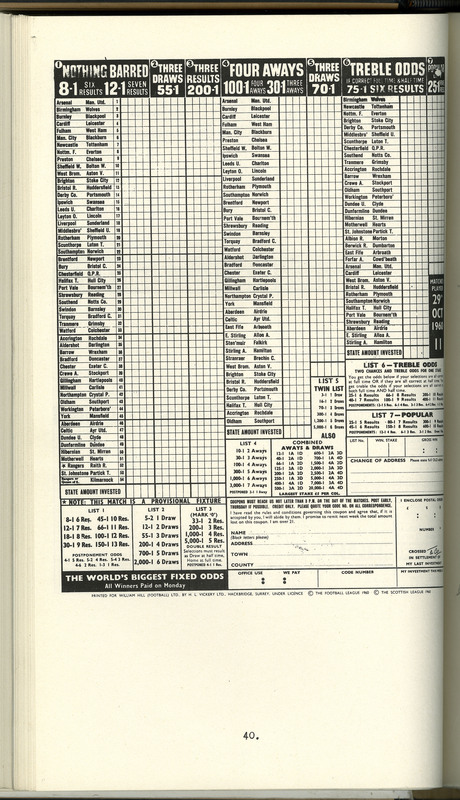 Instead of football coupons, it embraced the possibility of protecting the information contained in the coupons: the fixtures. Interestingly, the object of the Bill was to allow the Football League (and the Association) to claim royalties on the use of betting fixtures. Although the politician who proposed the introduction of the Bill, Mr Harry Howarth (1916-1969) had the support of the then Minister responsible for sport, Dennis Howell (1923-1998), his political dream drastically faded away when the Board of Trade opposed it, criticising it for encompassing a fundamental departure from the principles of existing copyright legislation. The question of protection of fixtures has returned to the courts in recent years in the context of the European Union’s Database Directive, Directive 96/9/EC. In three “Fixtures Marketing” cases, the Court of Justice has indicated that database right does not subsist in football fixture lists. In the light of EU harmonization of copyright, in particular the Infopaq decision of the Court of Justice, the significance of the Ladbroke case in the UK is a little unclear (though it will be of persuasive value in countries that derive their copyright laws from the UK Copyright Act 1911). Whether Ladbroke would be decided the same way following the European test (“author’s own intellectual creation”) is unclear. Precisely what “choices” were made by the author(s) of the coupons, how much freedom there was (whether they were “creative choices”, and whether the author(s) stamped his, her or their “personal touch” can only be assessed through a detailed examination of the facts. 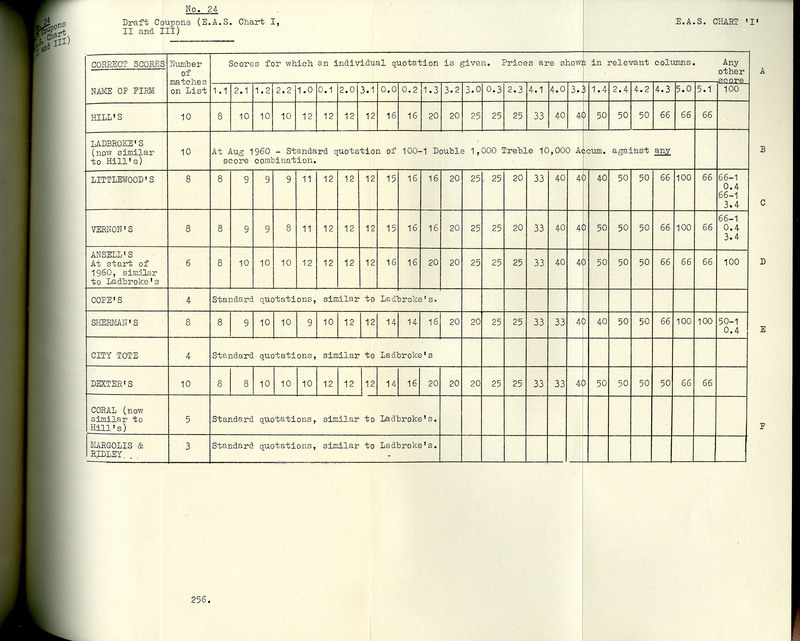 The images reproduced here help with such an assessment.